PMBOK 5 Coming: What to do? 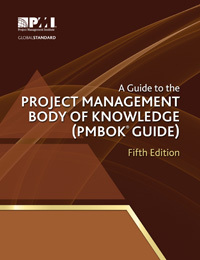 PMI has started taking advance orders for the Fifth Edition of A Guide to the Project Management Body of Knowledge (PMBOK® Guide). I will refer this edition as PMBOK - Fifth Edition (or shortly PMBOK5) from now on in this article. PMI will be publishing the new edition in early January 2013. The PMP exam will be based on PMBOK - Fourth Edition until 31 July 2013. If you are appearing for the exam after 31 July 2013, you have to study based on the updated PMBOK - Fifth Edition. What are the major changes expected? 1. A 10th Knowledge Area has been added and it will be known as Project Stakeholder Management. These four processes are included to reinforce the concept that each major Knowledge Area has a planning process focusing on how that area will be planned and executed. Including these planning processes also clears the inconsistency noted in PMBOK4 where certain management plans were not explicitly shown as outputs of any process. I will discuss, in detail, about all the changes in PMBOK5 once PMI officially releases a copy. How does the new version affect me? If you are in Category 1, please go ahead and complete the exam. Don't bother too much about the upcoming changes in PMBOK5. Your focus should be on PMBOK4 and clearing it on your first try. You have no time to play with. Don't mess it around; prepare well for the exam. Would like to know how I passed my PMP exam in first attempt? If you are in Category 2, don't waste time. Quickly schedule your exam. The exam dates might become very difficult to get as you get closer to 31 July 2013. And, once again, you should prepare well to hit bulls eye on your first shot. Time is not with you. Time to take a decision. You have a choice to make. Rush for the established and well known PMBOK4 (or) wait for about 9 months to a year so that PMBOK5 becomes stable and you have enough materials for your exam preparation. If you would like to get the PMP quickly, go for the PMP training at the earliest (I suggest by this month). The more you delay, it would be difficult for you to appear for the exam based on PMBOK 4. If you need further details on the above changes (or) if you are interested in any training for PMP examination, you can contact me at manick.pmp@gmail.com. As we all know the PMBOK® Guide is the global standard for project management. It provides fundamental practices needed to achieve organizational results and excellence in the practice of project management. I also took my PMP Classes from PMstudy. You can have a look at their offerings.